Sometimes I read a book on some topic that inspires me to think of myself doing something with that topic– a book on aircraft design might make me wonder how I would fare as an aerospace engineer. Other books I read help me appreciate a topic or activity without necessarily wanting to do it myself (cf. A Blistered Kind of Love). Winterdance did neither of these. It made me say, repeatedly and often aloud, that this guy is flat-out crazy. The Iditarod is one of the most grueling events in the world, and this guy wanted to run it. The story of his preparation for the races made me alternately wince (mostly for his wife, poor soul) and cringe. Imagine: sleeping with your dog team in its kennel, in your yard; letting fifteen sled dogs pull you on a bicycle then having to walk fifteen-plus miles home after they run off and leave you; getting sprayed by half a dozen skunks. The race itself is no better. I found myself unable to stop reading and concurrently wishing the book would end on the next page. I can’t really recommend it, but it was definitely an experience that will alter how I see future books. 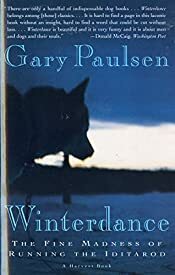 In fact, perhaps that’s the best summary I can come up with: the book is like the Iditarod in that respect.